A Robert Stigwood Organisation (London) Production. Fresh Cream was Creams first effort. It is a blues album and is probably the only true blues Album Cream ever recorded. I will just hit the hightlights. Spoonful is one of the finest songs they ever recorded in the studio. It shows Eric Clapton playing at his very best. Another favorite song is the Robert Johnson classic "Four until late, its is the only song on the LP that Clapton sings solo on. It shows you his love affair with the songs of Robert Johnson. Rollin and Tumblin is another Robert Johnson song. It is actually just part of "Come into my kitchen". The Version on Unplugged and Me and Mr Johnson to me are much better. And finally Toad which is Ginger Bakers song. He does a very impressive drum solo. As breathtaking today as it was when it was first released. Listening to this, you can understand the hype that Cream still gets as the first Supergroup. A pity that egos had to end this group early. For years I have read about the alleged poor production quality of this album but I did not find that to be the case. The production is unobtrusive and not all detrimental. All three musicians are in top form with Clapton overdubbed far more than he was on the "Beano" album. Clapton's overdub skills are rarely commented upon but check out his work on "Sweet Wine" to get a glimpse of what he was capable of in 1966! Standout tracks include; "I Feel Free", "N.S.U. ", "Sleepy Time Time", "Sweet Wine", "Spoonful", "Cat's Squirrel", "Rollin' and Tumblin'", "I'm So Glad" and "Toad". Check out EC's vocals on Robert Johnson's "Four Until Late". Want some fun...play "Four Until Late" followed immediately by "Find Myself" from REPTILE. The songs are striking similar and yet distinctly different. Incidentally, Heavy Metal did not begin with the original Jeff Beck Group or with Led Zeppelin, it began here with Jack, Eric and Ginger. There is not much one can say, other than this has to be one of the greatest and most impressive debut albums ever recorded by any rock band. Eric Clapton's playing is breathtaking, especially his solo on "Spoonful". 36 years on and still a masterpiece is this album. Take a long look at the cover of this album. That shot says almost all you need to know about this album. 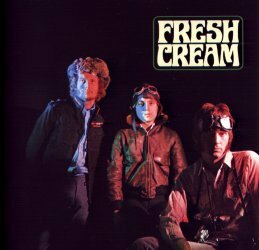 Cream reached the pinnacle of 60's Psychedelic Rock with Fresh Cream. Eric's aviator goggles and cap let you know that the listener is in for one fine ride.